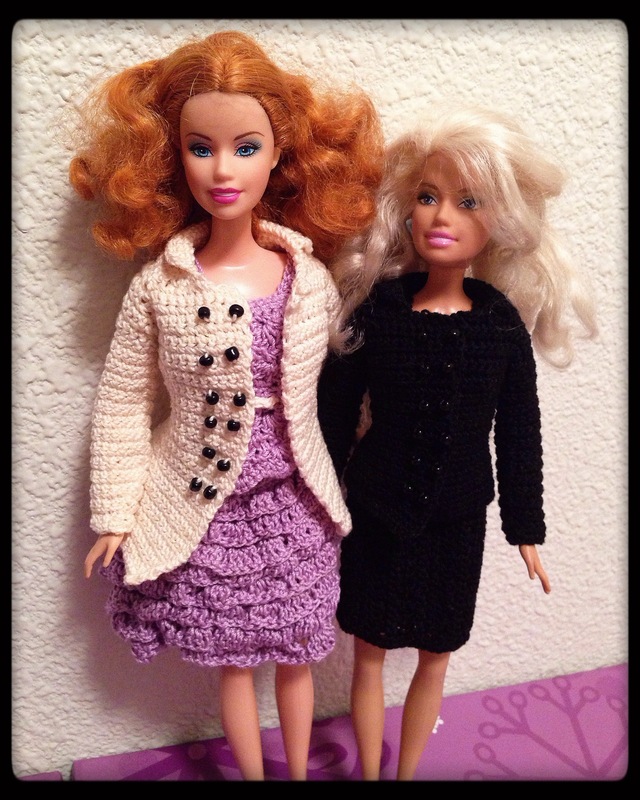 Peacoat Pattern | Barbie Who? 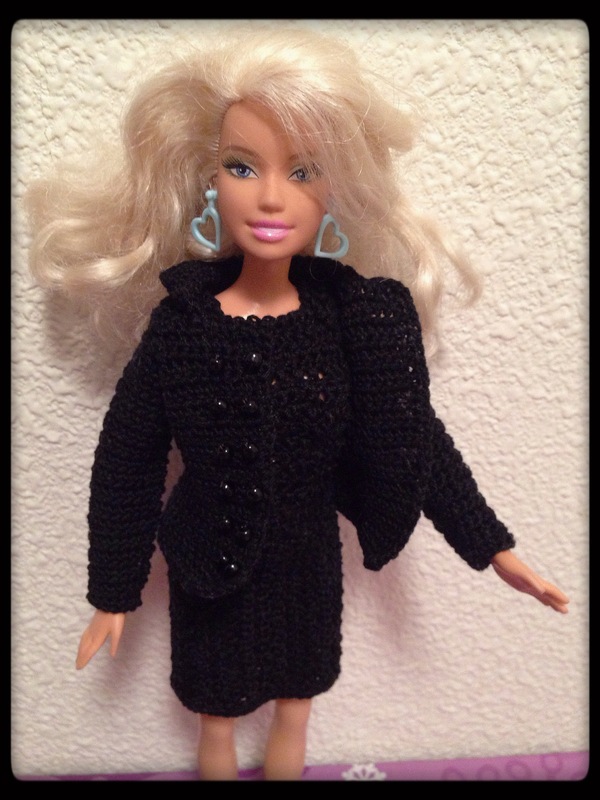 I created this pattern for a Barbie doll, and it will fit most 11.5″ fashion dolls. You can adjust the length of the jacket for your needs; the off-white coat is a mid-length style and the black coat is a jacket/blazer length. – I suggest that you leave extra-long tails on the yarn when making this so that you can use the tails to sew snaps and beads at the end. This isn’t required, but I find it easier to do it that way than to join in a new piece of yarn just for the snaps. – This pattern can be modified for length. I have a note in the pattern that explains the two lengths pictured above. End the pattern here for a short length peacoat (like the one I used for Cofelia’s jacket). Continue for a longer coat (like the off-white one pictured above). This blends in best when you join in the thread going in the same direction as the stitches in the sleeve. When decreasing, you can stagger the decreases if you’d like, but I found it worked just as well to always eliminate the last stitch in the row. I staggered them in the off- white jacket and did it at the end of all rows for the black jacket. Both sleeves look the same on the doll. If you have a hard time seeing where each stitch is, it will help for you to do a foundation row of slip stitches along the top of the jacket. This row should consist of 42 stitches. From the right (doll’s right) top of the jacket, Skip 10 stitches and join into collar. Sc 22 across the collar. Slip stitch next stitch. Turn. Skip first 2 stitches, sc 22, sc into collar. Slip next stitch in collar. Turn. Finish crocheting by slip stitching down the collar and doing a row of single crochets down the edges of the coat. Stop at the top of the collar on the opposite side before casting off. You don’t need to do this step, but it makes for a more finished look – the black jacket includes this finishing row while the off-white jacket does not have this finishing row. 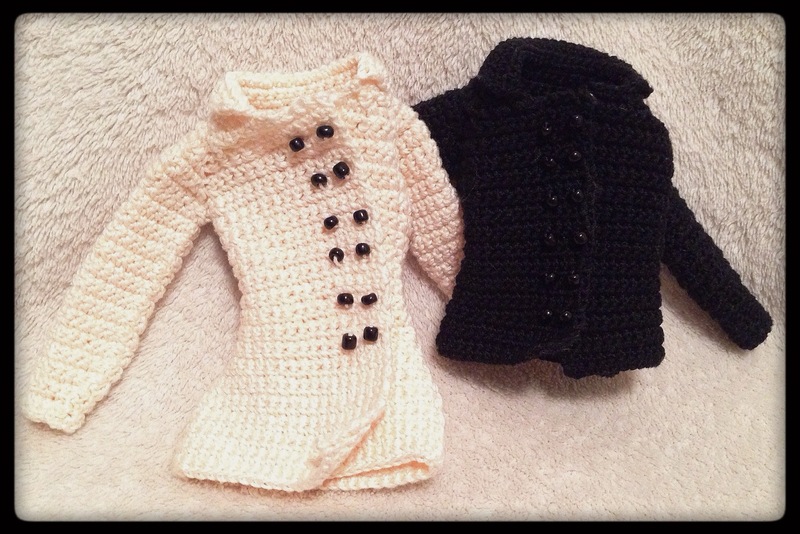 Finish the jacket by sewing beads as decorative buttons on the right flap of the jacket (outer side – doll’s right). You should do 5 or 6 rows consisting of 2 black beads each. Add snaps as closures to the inner flaps of the jacket – I used 4 but you could get away with two or three if you want a less fitted look. For an open look, you can leave odd the snaps all together. This is my original pattern and protected by copyright law. These instructions may not be duplicated, distributed, or sold in any form. You are welcome to create and sell the items that you make using this pattern; I kindly ask that you link back to my blog if you choose to do so. If you make this pattern, please let me know! I would love to see your work, and I will update the pattern as needed with the feedback given. Lovely pattern. It makes me wish that I could crochet. I’ve attempted to learn a few times and I jusst don’t get it although I intend to have another go soon. 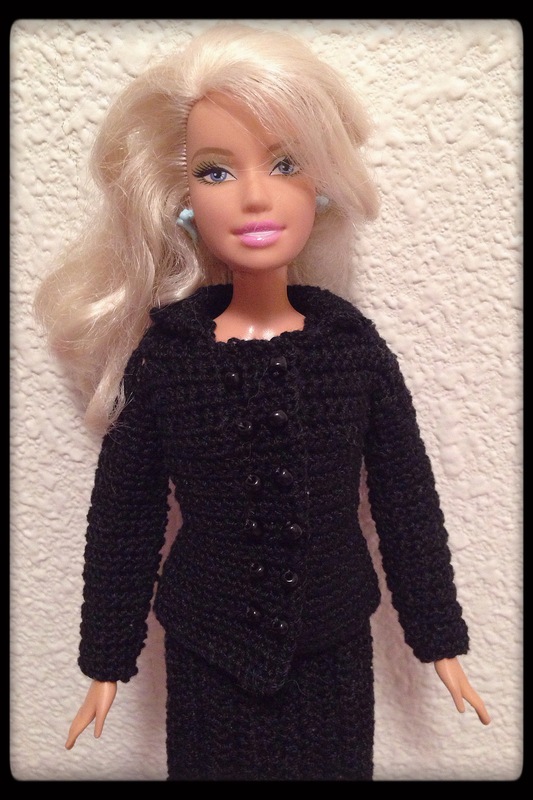 Crochet seems to hold it’s shape better on Barbie than knitted outfits which can look floppy. I knit a bit and am starting to experiment with crochet cotton and finer needles to see if that helps. How cool! Your work is beautiful and I LOVE the idea. This is serious dedication to the cause and I can’t wait to see how things turn out. 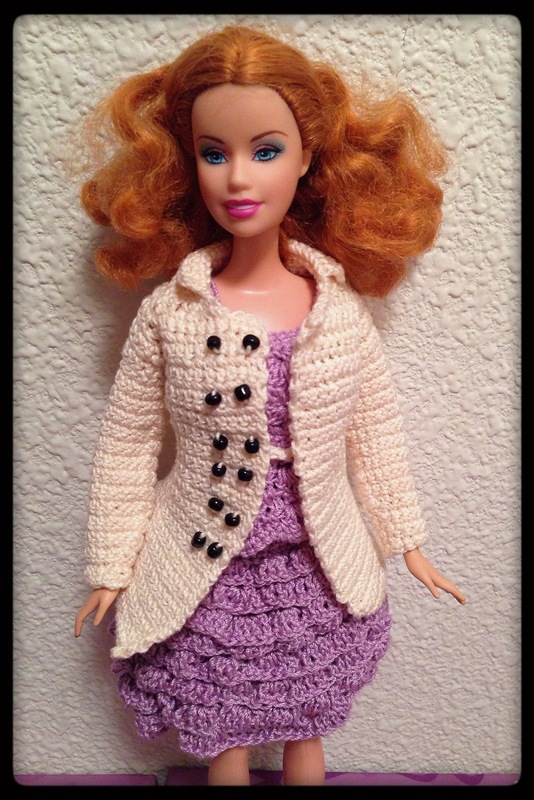 Pingback: Peri’s Outfit | Barbie Who?